Doug lives in Atlanta, Georgia, where he works as a sound tech at such venues as the Star Bar, Eddie's Attic, and for corporate events. 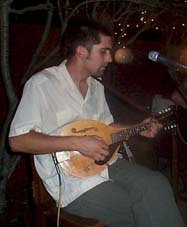 He currently sings for a band called Nekkid, and pulls out his mandolin for the acoustic shows billed as Half Nekkid. Most of his mandolin playing has been with Athens-based bands: Deuce, Twain, and a stint as road manager for the Bill Mallonee and the Vigilantes of Love, where he played bass and mandolin on a couple songs each night. Doug's instrument is a '62 Gibson A-40-N, outfitted with a Fishman pickup, which he plays through an L. R. Baggs Para-Acoustic D.I. You can reach Doug by .